Class 11 is an ideal time to start preparing for NEET examination. Class 11 syllabus is the base that helps in covering class 12 syllabus for NEET. Be regular with your study schedule and NEET classes. Don’t get worried about where to start and how to study for NEET. This post will guide you about the things that are important for NEET preparation in class 11. Here are some tips for starting NEET preparation in class 11. Know the Syllabus of NEET : One of the first thing when starting NEET preparation is to know the syllabus of NEET. It contains the topics from class 11 and 12. It may look humongous to see the full syllabus at first glance but don’t worry it’s a gradual process of learning, step by step, topic by topic, question by question, to complete the syllabus in 2 years. During the course of the preparation, you are advised to have a quick scan at the syllabus and look out for any missing topics. If a topic is not covered, you can discuss the same with the teacher in the class. The Books and Material Recommended for NEET : If you have joined a coaching then your study material is more than enough to cover the syllabus. It will have all the theory and questions according to NEET level. In books, NCERT is recommended for Biology and Chemistry. If required, see the reference books for NEET. Best time to study for NEET : When do you feel the most active? Go with your strength and comfort level. Morning or night study really doesn’t matter as long as you are achieving your set targets. You can try to study at various times during the day, morning and evening. Soon you’ll get to know the best time to study that gives you fruitful results. Understanding concepts and practice : First understand the theory part, and then practice problems. It’s the way to understand concepts in a better way. Never hesitate to get your doubts cleared from the teacher. In the exam, time management and pattern of solving questions is important. It can be only achieved by serious dedicated practice and questions solving. Avoid Backlogs : When a topic is taught in the class, study the same topic from coaching module or NCERT. Finish all your DPPs and coaching module exercises as they are being taught. Don’t keep pending work. Do your homework/assignments on time. Revision is the key : We tend to forget topics with time if they are not interconnected. So a periodic revision is must i.e. daily, weekly and monthly revision. Always revise important points, MCQs before sleeping. Analyse tests and learn from mistakes : After attempting a test, count the marks you lose due to silly mistakes, conceptual error, wrong interpretation of any question and other mistakes. Make sure not to repeat the same mistake again in the subsequent tests. It’s recommended to join a coaching for systematic NEET preparation in class 11. 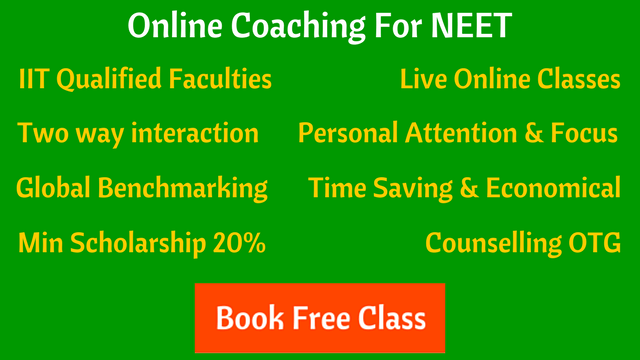 The teachers will tell you the right schedule and strategy to study effectively for NEET. [Online courses are available from the comfort of your home]. The next two years will be the most precious years of your life. The momentum that you build now, in class 11, will help you in achieving your goal to clear NEET and become a doctor.